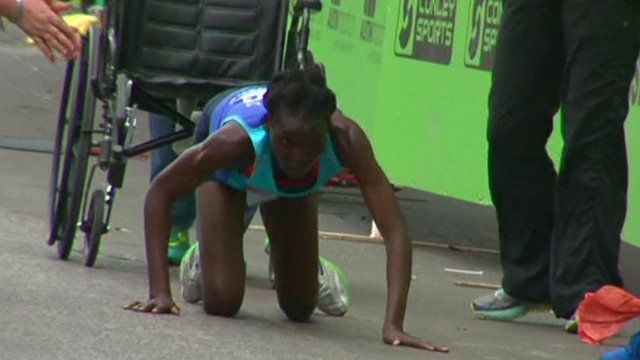 Marathon runner crawls to finish line Jump to media player A Kenyan marathon runner has crawled to the finish line after collapsing 50 metres from the end of the race in Austin, Texas. Running a marathon in a smog mask Jump to media player The Chinese capital has been suffering under heavy smog for the past few weeks, but the 34th edition of the Beijing marathon still went ahead on Sunday. Runners brave the cold for ice marathon Jump to media player Running a marathon is hard enough - but how about doing it in temperatures as low as -50 degrees? Pyongyang marathon was 'quite funny' Jump to media player Foreign amateur runners have been allowed to compete in a North Korean marathon for the first time in 30 years. A Kenyan marathon runner has crawled to the finish line after collapsing 50 metres from the end of the race in Austin, Texas. Hyvon Ngetich had been leading the race when she fell. Medical staff monitored the 29-year-old as she made her way to the finish - after she declined a wheelchair.